Prior to coming in to see one of the chiropractors at Town Health Solutions, one of the questions we receive is ‘what is a first visit to a chiropractor like?’. We are happy to tell you! Based on where you are, you’ll be greeted by one of our friendly front desk staff, either Faith in Saint John, Raylene in Sussex, Brenda in Hampton, or the other Raylene in St. Stephen. They’ll provide you with a short intake form so we can get some basic information about yourself. At this point, you’ll meet the chiropractor who will be overseeing your visit. The first visit takes approximately one hour, so we ask our patients to please plan their schedule accordingly. Our staff being thorough is an understatement. We don’t want to just help you feel better, we want to find out why you felt bad in the first place, and try to reduce the likelihood of it coming back. We will spend approximately 20 minutes asking you not just about the where, what, and how, but also try to tease out the why. We’ll be interested in your lifestyle, medical history, and anything that can help us help you. Here, your chiropractor will watch you move, perform orthopaedic and neurological tests, functional tests to evaluate how muscles and joints behave through different tasks, and also tests to ensure that you don’t have anything more serious that would necessitate a medical referral. 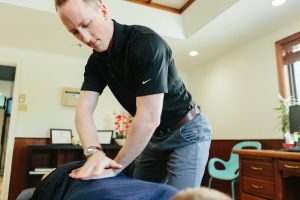 At this stage, your chiropractor will explain everything they found in a very clear, concise, and understandable manner, without overusing too much technical jargon. You’ll be told your diagnosis, functional findings, how your case history relates to your issues, and what the plan is including what treatment will include, and how many visits it will likely take (acute cases take between 8-12 visits). Everything will be clearly and simply explained. Your chiropractor is trained in many different strategies, that are applied uniquely to YOU, the individual. There is no cookie cutter approach at Town Health. Treatment may include soft tissue therapy, spinal or extremity manipulation, active exercise, nutritional recommendations, functional neurology, modalities such as shockwave or laser, and support on navigating your life for the next few weeks. Treatment is very specific to your particular needs. So that’s your first visit! We hope that it answers some of your questions and we look forward to being able to help you!